Conducting research for your homework project can be the most enjoyable aspect of the entire task. Essentially, research is a form of exploration. Use your imagination and call upon a wide variety of sources in order to enrich and bring vitality to your homework project, boosting to your knowledge of the subject as you go. The library may not seem like the most exciting of environments but it can prove a treasure trove if you know where to look. Get to grips with the classification system at your school, college or local library. This will allow you to browse the shelves expertly and with ease. Choose around ten books from the shelves that might be relevant to your project and take them to a quiet place within the library. Have a flick through these volumes, stopping occasionally to take in new facts and glance at interesting pictures. Keep an open mind, but at the same time try to asses how useful each book might be to your homework project. Narrow your selection down to five books and focus on these in more detail. As the web develops, grows and spirals, it becomes an ever more useful research tool. Try conducting a simple research task by using a general search engine to explore what has been said about your topic on the Internet. This might open up whole new trails and avenues of thought that you had not previously considered. Use a reliable information site as a form of encyclopaedia but don't shy away from websites that are more devoted to opinions and anecdotes. 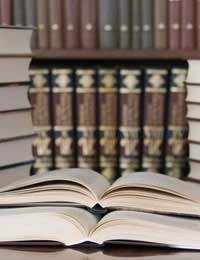 So long as you present any information that you find on such sites as opinion, rather than fact, quoting such evidence can bring thought-provoking angles to your work.You might also like to look at learned journals and online articles if your school or college has a subscription to a relevant website. Speak to your teacher or librarian for more information on these resources. Your project might offer you the perfect opportunity to become an investigative journalist or an interviewer for the day. If you can think of anyone you know who does a related job or has experiences relevant to your project, it is worth considering approaching them to see if they would be happy to be interviewed. For example, if you were conducting research for a project on the 1960s, you might like to speak to a parent or grandparent who has fond memories of that decade. Devise a number of questions in advance and use a tape recorder if you are worried that your note taking skills are not quite speedy enough. Take time to have a think if there are any museums, local to you or slightly further afield, which are relevant to your project. Such hives of information are always enjoyable to explore but they can be especially exciting when you have a clear mission in mind. Be sure to take a camera and a notepad along with you to document your discoveries. A notepad is not just essential when visiting a museum. Ensure that you keep detailed notes throughout your research period. Jot down useful quotes, facts and statistics that you could incorporate into your project. Be sure to note down where each piece of information came from, to ensure that you will be able to reference your sources correctly. Though following this advice, you will have created your own short guide to the subject on which your project focuses. All that remains to be done is to mix this up with your own ideas, create an effective structure and think about the way in which you would like to present your project.